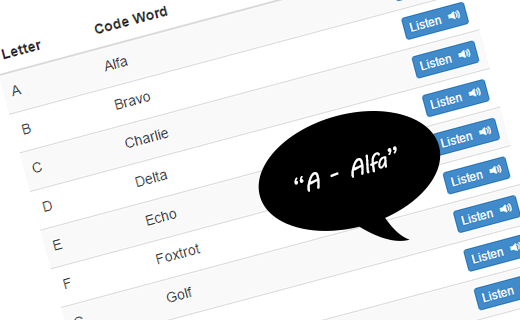 On SpellingAlphabets.com you'll find spelling alphabets (also known as the phonetic alphabets) from around the world, including NATO's phonetic alphabet (International Spelling Alphabet). Each alphabet has a sound clip for each letter in the alphabet and for numbers one to nine. The Portuguese spelling alphabet has also been added to the website. The Danish spelling alphabet has been added to the website. New spelling alphabets added to the page: The Italian spelling alphabet, French spelling alphabet, Norwegian spelling alphabet, and the Dutch spelling alphabet. New responsive design for computers and mobile devices.